The correct title of this article is Beyblade Ultimate Synchrom DX Set Attack & Balance Type. The substitution or omission of the & is due to technical restrictions. TAKARA-TOMY released this set on November 17th, 2012 for approximately 3150 yen. This product and the Beyblade Ultimate Synchrom DX Set Defense & Stamina Type were released as obvious Christmas present suggestions in Japan, to attempt to boost the sales of the series. 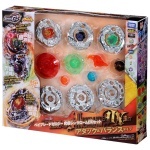 Following the logic that TAKARA-TOMY releases better parts at every passing month, as some of the last few products of the Metal Fight Beyblade Zero-G line this Set and the Beyblade Ultimate Synchrom DX Set Defense & Stamina Type contain some of the best parts for all Metal Fight Beyblade metagames. The inclusion of six Chrome Wheels represents a great deal regardless of competitive value, but Ifraid, Saramanda, Balro, Gryph and Girago have all found use in good combinations for Attack and Balance types. SA165 is an essential top-tier Track for several types of customizations, and GCF's ability to embrace the curve of the stadium guarantees the base for excellent Zero-G Attack. For all these reasons, every Blader should own at least one of this Set. This page was last modified on 15 July 2013, at 23:00. This page has been accessed 11,994 times.